The Historic City of London Treasure Hunt. This eventful journey cuts a fascinating swathe through the historic heart of the old City of London. It snakes its mystifying way through a warren of ancient alleyways, hidden courtyards, narrow thoroughfares and elusive churchyards. Each place visited is cobwebbed by time and each place has some wonderfully tucked away items that you must seek out in order to solve the clues and get ahead of the game. Those cryptic conundrums are cunningly disguised in a variety of evocative locations that will prove an absolute joy to discover. Fun, bafflement, fascination and true discovery await you on a delightful quest into London's eventful past. The Historic City quest begins on the steps of the Royal Exchange, a magnificent building that sets the scene for what lies ahead. Weaving your way in and out of a veritable warren of tiny alleyways you will need to be on your look out for historic items of street furniture or little fragments of bygone ages that have somehow managed to survive the march of time and which have found themselves marooned in the present. They might be located high up on walls, they could be hidden in doorways, they could be tucked away down secret passages, they might be gazing down from ancient guttering or carved onto time-worn tombstones, or they could simply be hiding in plain sight and you may have passed them on a daily basis and not noticed that they are there!. Some, no doubt, will be buried beneath centuries of city grime, and others are even embedded into the very cobbles that you walk on as you twist and turn your way through this fascinating and memorable route. Even the street names on this delightfully historic wander will resonate with the ambience of times gone by. 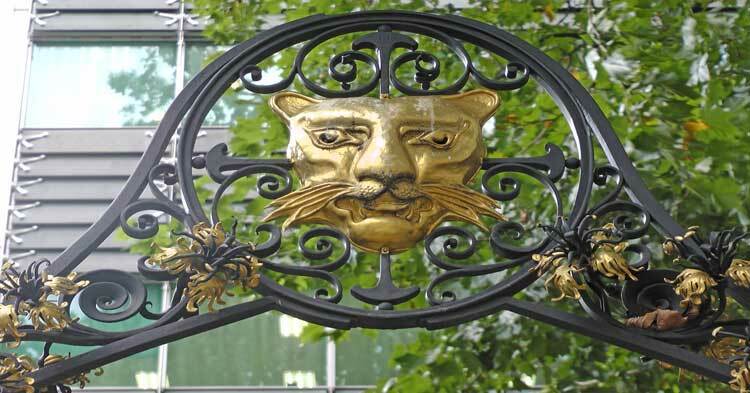 Love Lane, Wood Street, Friday Street, Pope's Head Alley and Bengal Court are just a few of the ancient thoroughfares you will encounter in the course of the Historic City of London Treasure Hunt. Old churches and stately buildings nestle cheek by jowl with ancient pubs and magnificent old halls. 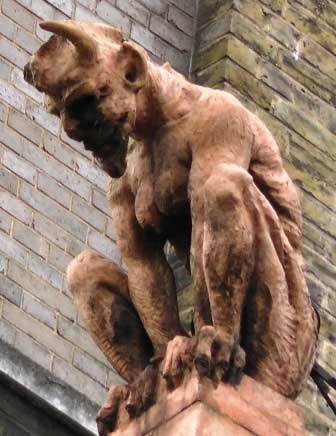 One church even has this handsome stone demon gazing down on passersby from its rooftop. The question is - will you be able to spot him as you attempt to solve what is one of our most devilish challenges imaginable! You will even get to gaze upon the spectacular Guildhall - London's medieval palace - where several intriguing clues will be found on the ancient stonework. Roman London, Anglo Saxon London and even the London of Charles Dickens will spring to vivid and inspiring life as the old historic city gives up its secrets and provides you with challenge after challenge to get those little grey cells connecting and set you on the road to, hopefully, ultimate victory. Statues to famous London figures, plaques that contain little nuggets of genuinely fascinating information, City institutions around which a wealth of anecdotes have gathered over the centuries. All these have been pressed in to service to provide you with some terrific clues, terrifically challenging observation questions and seemingly impossible photo challenges. Actually they're not that impossible because you'll encounter the answers to all of them as you wend your merry way around the treasure hunt route. The question is will you spot them and help your team pull ahead of your competitors, or will your competitors leave you standing? So, by fair means or foul, it should be possible to find the answer to each question and thus increase your teams score. Whether you are looking for a team building activity, an evening event that will get yourself, your friends and work colleagues out onto the streets of London, or even an enjoyable Saturday or Sunday morning or afternoon for a social gathering, hen party or birthday party, the old historic city will provide the perfect backcloth against which to race against the other teams to achieve the ultimate goal of being a member of the team that romps past the finishing post with all questions answered, all landmarks discovered, and all stones turned, inspected and then returned to their original position. Well, that's the theory at least! The cost of the Historic City Self Managed Treasure Hunt Package is £140.00 for 4 packs. Exit Three of Bank Underground Station. The Lord Raglan is sometimes closed on Sundays and on Public Holidays.